Just when I was wondering if I would ever ride cyclocross again, I managed to find the time to dig out my bike and restart doing some of the rough stuff. 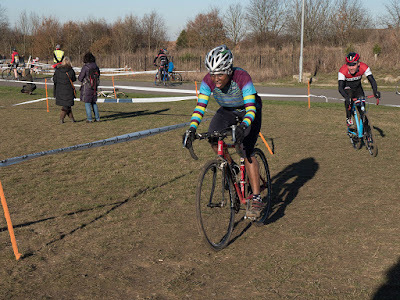 There's not much to say about it except that I found it lots of fun, and it's been so long since I last raced that in the words of the cook on Poldark, "I've mislaid me skillage!" But I survived, and I didn't come last. The sun even shone on both of the races I did. Anyway, just to prove that I'm not making it up, here are a couple of pics care of some very nice souls who thought it was worth a shot photographing me! I am lucky to have not gotten too muddy as conditions so far have been dry, which gives an opportunity to ease into the sport. My first race was at Leeds Castle, near Maidstone - incredibly bumpy, quite challenging and with a hill that completely killed people's legs! There was also moat (also known as a swamp), that people ended up jumping into after clearing the low hurdles. As I had travelled to the venue by train and had no change of socks or shoes I preferred to go round and wade through the long grass! It added a bit of time to my ride, but at least my feet weren't sopping wet for the long journey home. The lady in the London Dynamo kit is Claire Richardson. She was actually walking up that hill at the same speed that I rode it! We then battled it out for the finish line and I managed to get ahead of her by some fluke! My second race was the South East and Eastern Regional Championships held at the Cyclopark near Dartford, Kent. Just when I thought that races couldn't get harder than at Leeds the course builders came up with another leg-sapping course! Very technical with a number of dismounts - to get over steps, high hurdles, a horribly steep hill, a deep sandpit, and I had to get off for a few adverse cambers that I just couldn't negotiate. The lady in the pink jersey is Liz Orr of Kent Velo Girls. She was very good technically and was ahead of me for most of the race, but all I can say is thank goodness for tarmac! I was able to put in a bit of power on the road up to the finish line, and that's the only reason I was able to get past her. 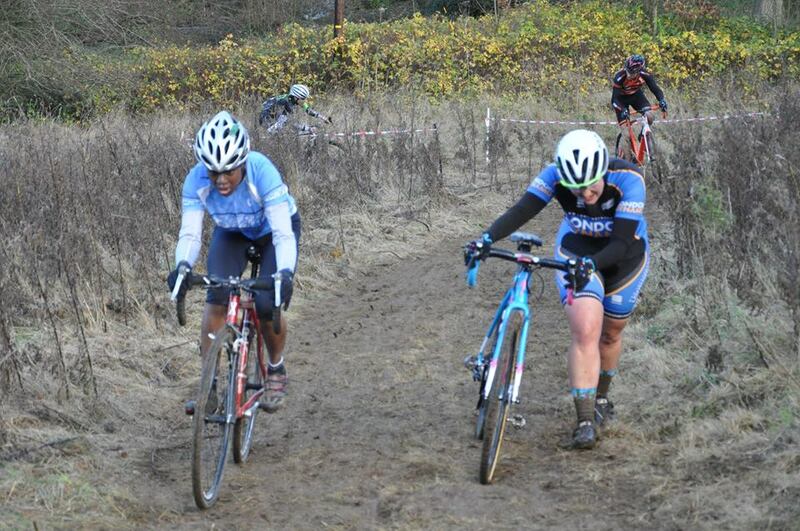 Next time we will be in an "old school" course nearer to home in the suburbs of Croydon, where there will be pure mud. So I am not sure I will be so lucky to stay ahead of Claire or Liz. 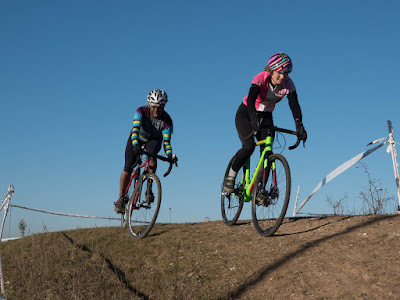 But whatever happens, just doing cyclocross will brighten up my day and I will be appreciative of the folks who cheer (or even jeer) me on as I haul and slide my way around the course.